I don't know about you, but I don't care for light, cakey brownies--for me, the denser, fudgier, and heavier, the better. Macrina's Caramel turtle brownies are my kind of brownie. Weighing roughly the same amount as a brick, they're so dense, moist, and fudgy that it's almost impossible to finish the entire thing in one sitting. Almost. While I generally don't think that toppings or flavorings are necessary with brownies, the caramel-nut combo is a nice complement: the caramel is smooth and slightly salty, providing a nice subtle counter-flavor to the chocolate; the pecans give it a nice added texture. Of course, after eating one of these brownies you might have to just sit down and rest for a while, but oh, are they worth it. 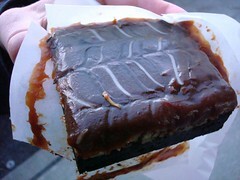 The Caramel Turtle Brownie is $3.50 at Macrina Bakery.